Though they had been invented a couple hundred years prior, the 19th century saw the explosion of the railroad as both a mode of transportation and of moving cargo. The Army Corps of Engineers was instrumental in helping private enterprise build the American railroads, beginning in 1829 in Massachusetts, and culminating in the Transcontinental Railroad, which connected the eastern United States with the west in May of 1869, when the so-called golden spike was driven at Promontory Summit, Utah. Railways were first used in England during the 17th century, and American saw its first railway built in 1764 in Lewiston, New York, for use by military. In 1809, John Thompson made the first survey map in America. That map showed a commercial tramroad in Pennsylvania, and in 1826, a commercial tramroad was built in Quincy, Massachusetts. John Stevens, often called the Father of American Railroads and a captain in George Washington's army received the first railroad charter in the New World in 1815. He then designed and built a steam engine and then built a circular track on his property in Hoboken, New Jersey, where he experimented with the feasibility of steam locomotion. Inventors and entrepreneurs made advances in the subsequent years, and in 1830, construction began on the Baltimore & Ohio Railroad -- which many know because of the board game Monopoly as the B&O -- became the first passenger train. By 1831, the B&O traversed the distance between Baltimore and Frederick, Maryland, and it was soon joined by the Mohawk & Hudson -- which later became the Albany & Schenectady Railroad -- as well as the South Carolina Canal & Rail Road Company, which was the longest steam engine railroad in the world. By 1835, Pennsylvania, Boston, and Providence were connected by rail. Most railroads and railroad connections were built willy-nilly, with no real planning for expansion, and were made for short passenger routes. These short routes necessitated other modes of transportation to get from the end of one rail line to the beginning of the next, which proved to be financially unsustainable for the investors, who tried to worked to find ways and the means to connect the heretofore isolated railways. By 1850, there were railroads connecting San Francisco to Omaha, and Omaha to Chicago. Towns grew up around the railroads and flourished as workers became busy, and rich men, who were soon to be richer, invested in this mode of transportation and logistics. And the new form of moving products and people began replacing steamboats, canal travel, and turnpikes in the cargo-moving industry. Meanwhile, a New York City merchant named Asa Whitney had become obsessed with the idea of a transcontinental railroad connecting the Atlantic coast to the Pacific Coast. He proposed the hiring of the abundant pool of recent immigrants from Ireland and Germany, paying them in land. This brilliant idea of paying with land ensured that there would be settlements and settlers along the route to provide labor along the line as well as becoming customers of that form of transportation. The California Gold Rush, the end of the Mexican War, and the entry of California into the Union allowed Asa's dream to be realized, as the Pony Express could not service such an expansion, and people were moving west in droves. The issue came before Congress, and in 1853, Secretary of War Jefferson Davis was given the task of ensuring that several possible routes to California and Oregon would be made. He sent out six parties to survey the possible routes across the country. During that time, the Army was involved in skirmishes with various Indian tribes, particularly in the west, and numerous military members of the exploration parties came under attack. Congress had its advocates of the transcontinental railroad, but it had its naysayers as well, with northern legislators objecting to the southern routes and the southern legislators objecting to the northern routes. After ten years of debates and disagreements among the legislators with no progress toward connecting the coasts, Theodore Judah, engineer of the Sacramento Valley Railroad, approached a handful of local businessmen to ask for funding. He found four major backers in Leland Stanford, Mark Hopkins, Charles Crocker, and Collis P. Huntington, who would later be ranked among what history classes for decades would call robber barons. Those businessmen were excited about the idea and funded the Central Pacific Railroad Co. of California, which merged with the Southern Pacific Railroad. President Abraham Lincoln, realizing the importance of such connections, signed The Railroad Act of 1862, and construction began on the Union Pacific Railroad in California and the Central Pacific. The Civil War made rail all the more important as soldiers, ammunition, food, and other commodities allowed them to keep fighting the war. The Union Army made great use of the rails, allowing the military, food, and equipment to go south, but blockading those trains which were headed north. Both sides realized the strategic importance of the new form of travel and used the rails to their own advantage. By 1862, food and supplies were becoming more and more difficult to come by as overburdened tracks became untravelable, and money for repairs had run out. The Union army had blocked or destroyed tracks which were essential to the Confederate Army, and they confiscated the train lines as they entered towns. Confederate soldiers burned and destroyed bridges, tracks, and train cars as they retreated from the advancing Yankee soldiers. 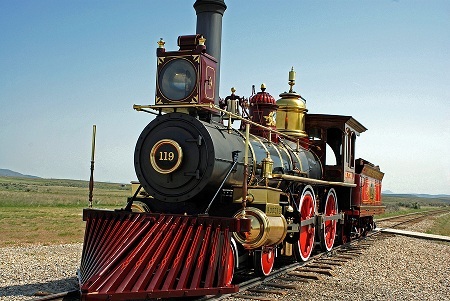 Between 1862 and 1869, construction on the First Transcontinental Railroad flourished. This route stretched 1,907 miles and connected San Francisco by merging with the existing railroads. The Western Pacific Railroad, which connected Oakland and Sacramento in California, the Central Pacific Company of California connected Sacramento to Promontory Summit in the Utah Territory, and the Union Pacific Railroad connected Promontory Summit to Council Bluffs, Iowa, across the Missouri River from Omaha. Finally, on May 10, 1869, with much fanfare, the "Golden Spike" was driven into the railroad at Promontory Summit by Stanford, symbolizing the connection between east and west and the completion of the Transcontinental Railroad, which flourished for more than 100 years, bringing people and cargo from one side of America to the other. Focuses on the work of George Pullman, who revolutionized train travel. Contains photographs of his various sleeping cars, his stroke of luck due to Lincoln's funeral train, and his other achievements. Displays details about the beginnings of the railroads in the United States, the Transcontinental Railroad, the growth of mapping as a profession and an avocation, and land grants. Seeks to answer questions about the early history of American railroads, delineates railroads by region, state, or name, and examines railroad maps from 1830 to 1850. Offers details and invites participation in a project which has the goal of recording the history of the American railroad network in one database. Contains important dates and events regarding railway history worldwide, rosters of who builds various locomotives and other facts about them. Search for Railroads on Google, Bing, or Yahoo!